In an increasingly digitalized world, books decline while movies rise in popularity. Throughout the years, popular books are made into movies, and fans typically get excited. Until they see the film. Countless times have I heard people complain about movie adaptations of their favorite books. Many such movies leave out key scenes or add ones or—heaven forbid—change an important character. A mixture of excitement and disappointment arises concerning movie adaptations. Even with good films, it seems that book fans always find something to complain about in the movie. So why should book fans even attend a movie adaption of their favorite books? Some of the most accurate of such adaptations include The Lord of the Rings trilogy and The Hunger Games. Although these films could not capture every detail from the books, I would consider these good adaptions because they captured the stories’ essence. Of course, I have still heard people complain about these movies because the directors left out elements the audience deemed important. On the other hand, some favorite books may have disappointing films. Despite the excitement over the Lord of the Rings trilogy, The Hobbit adaptations disappoints many fans because of all the changes and additions. Other movies that ruin major plot elements include Prince Caspian, The Voyage of the Dawn Treader, and Eragon. Nevertheless, several movie adaptations succeed despite inaccuracy, such as How To Train Your Dragon (1 and 2) and The Three Musketeers. BBC’s Sherlock could be added to this list for plot reasons, but the characters are very accurate to the books. Some devoted book fans often complain about movie adaptations, but other book fans may claim that the movie encourages more people to read the book. This is true to an extent, for not everybody reads. But I have read many different books because I learned about them from their film adaptations. This way, even non-readers may discuss certain stories—to an extent—with book fans. However, much controversy and sometimes contradictions exist over movie adaptations of biblical stories. Why should people give so much allowance to such adaptations but complain about minor changes within fiction? Why should people enjoy Paramount Pictures’ Noah because it gets people to read the Bible but complain about The Hobbit because Legolas and Tauriel were not in the book? Why should adaptations of Bible stories be allowed creative license but not adaptations of popular fiction? We, as an audience, should examine our priorities when it comes to critiquing movies. I am not against Scripture-based films because many of them may increase knowledge of biblical stories. Generally, I try not to be overly critical of films and just enjoy them for what they are, even though there are times when certain aspects irritate me. As a writer, it would be exciting to watch one of my stories turned into a movie. Overall, movie adaptions are the interpretations of the directors. If readers do not like that, fine. Just read the book. Unless the author directs the movie, the book will almost always be better. 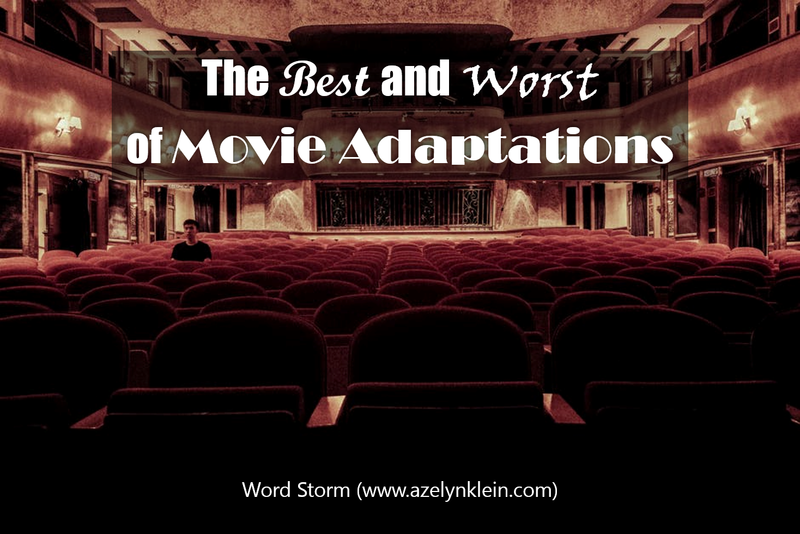 What stance do you take on movie adaptations? Is there a particular movie adaption of a book or a story that you enjoy/dislike? Original literary references: J.R.R. Tolkien’s The Lord of the Rings, Suzanne Collins’ The Hunger Games, C.S. Lewis’ The Chronicles of Narnia, Christopher Paolini’s Eragon, Cressida Cowell’s How to Train Your Dragon, Alexander Dumas’ The Three Musketeers, Sir Arthur Conan Doyle’s Sherlock Holmes collection, and the Holy Bible.